…so it’s completely rad to see your kid’s picture on a poster. 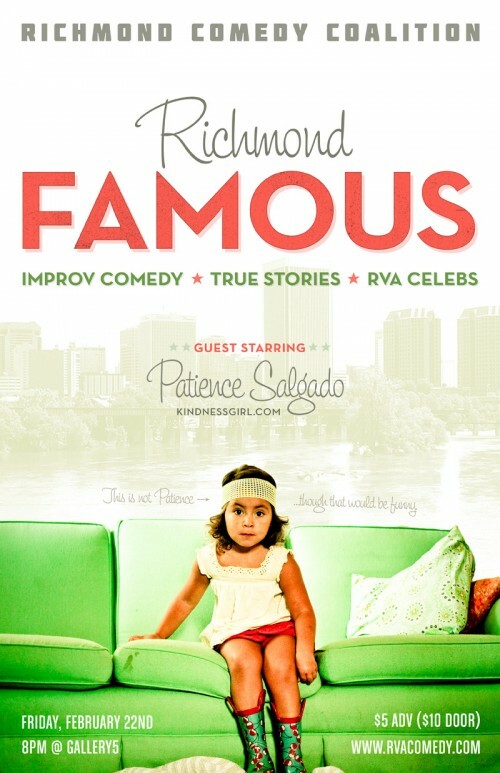 …and even more exciting to get to host the Richmond Comedy Coalition’s Richmond Famous Show THIS Friday at 8pm at Gallery5 !! If you have never been to a show, you especially HAVE to go. AND if you have been before, you have to come so there are lots of friends around to celebrate as wicked wit and kindness come together. Richmond Famous (just one of their many shows) is a show where the RCC invites a local friend/host to come and share a few stories, and then the actors improv-the-hell-outta that particular story. It’s ridiculously fun. I am SO excited to be included, and really happy to announce that Jennifer Lemons-Driskill (a.k.a The Check Out Girl) will be joining me for a Ukulele Sing-a-long during the show AND I will also be revealing a new kindness mission that night! Get a babysitter, take the bus, whatever you gotta do… but just come on out! You always make me wish I lived in Richmond. Hope you have a big turn out and a lot of fun!!!! So exciting for you- if I lived nearby I’d be there in a heart beat! You’ll do an awesome job! Wishing I lived closer so I could attend. Sounds FUNderful! Have a blast. I’m with you in heart and spirit! HUG! Oh Patience! I will be laughing my tuckus off from here in NYC for you. what an awesome opportunity for humor and kindness. I am so beyond the moon happy for you. I truly believe those are vital ingredients for the recipe of living life. Thank for this post- I really needed the reminder! that is so awesome. I’m excited for you!